McCormick, Tyler H.; Rudin, Cynthia; Madigan, David B. In many healthcare settings, patients visit healthcare professionals periodically and report multiple medical conditions, or symptoms, at each encounter. We propose a statistical modeling technique, called the Hierarchical Association Rule Model (HARM), that predicts a patient’s possible future symptoms given the patient’s current and past history of reported symptoms. 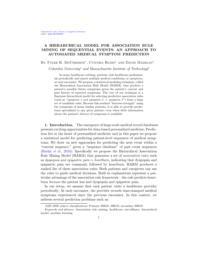 The core of our technique is a Bayesian hierarchical model for selecting predictive association rules (such as “symptom 1 and symptom 2 → symptom 3 ”) from a large set of candidate rules. Because this method “borrows strength” using the symptoms of many similar patients, it is able to provide predictions specialized to any given patient, even when little information about the patient’s history of symptoms is available.